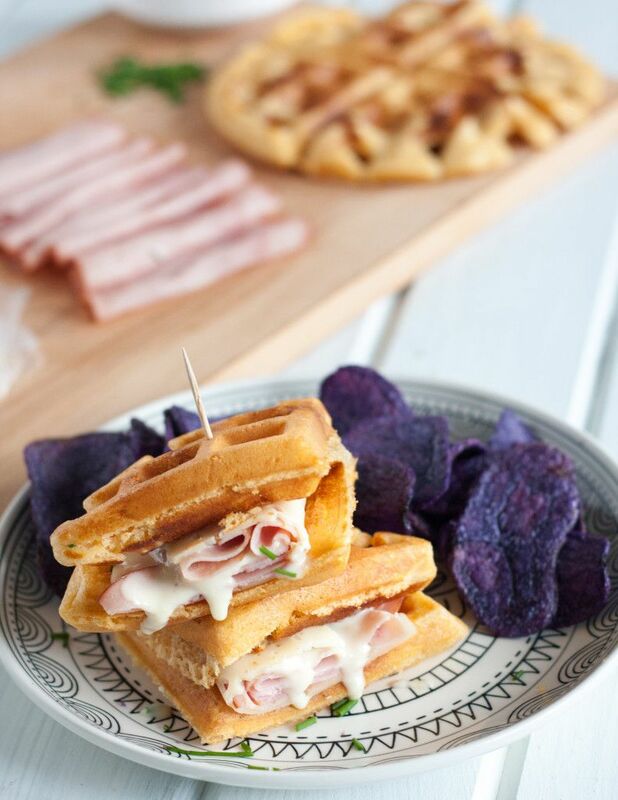 A croque monsieur waffle sandwich is a great dish to serve at brunch, lunch, or dinner! How much do you need a waffle sandwich in your life? Very much. I didn’t realize how much I needed to make waffle sandwiches at home until last fall’s trip to Walt Disney World with the small one. We ended up at the Magic Kingdom two different days and each day found a reason to eat at the Sleepy Hollow waffle stand in Liberty Square. The first day we picked up breakfast and then we came back the second for lunch. If you followed me on Instagram last year, you would have seen pictures, because I just adored the slightly sweet savory combination in the waffle sandwiches. So… I decided I needed to make my own, and I wanted to make them croque monsieur waffle sandwiches. Last year I had a bit of a thing with the croque monsieur flavor combination and Swiss cheese and ham were my preferred sandwich combo for a minute. 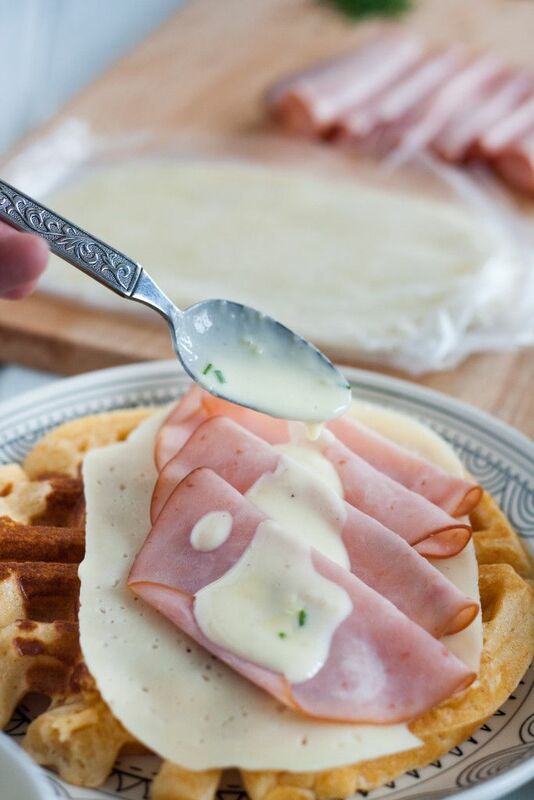 I think it works perfectly in a waffle sandwich because the waffle is slightly sweet, which compliments the slight sweetness in the ham, and it’s all balanced nicely by the little bit of sourness in the Swiss cheese. It’s good stuff. 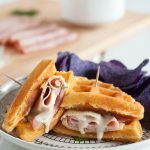 A croque monsieur waffle sandwich is a great non-egg option for a brunch, but I wouldn’t necessarily recommend them for a very large group unless you store the waffles in the oven to keep them nice and warm until it’s time to serve. 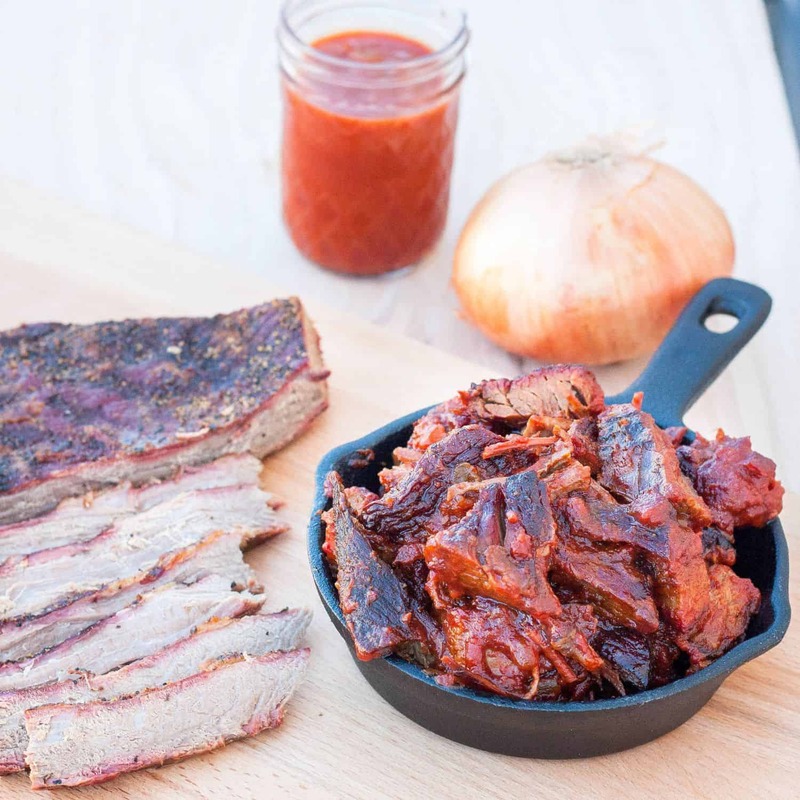 Even then, you’ll want everyone to assemble their sandwiches rather quickly. I feel like a group under 6 is manageable if you only have a single waffle iron. Be sure to remove the cheese and ham from the refrigerator 20 minutes before serving so both come closer to room temperature. To help the cheese melt, I served the sauce warm. You don’t need a fancy waffle maker for the waffles, we have a very basic model we found for under $20 at a local store that works well for us. It helps that it’s small too since our kitchen is small and pantry space is at a premium! 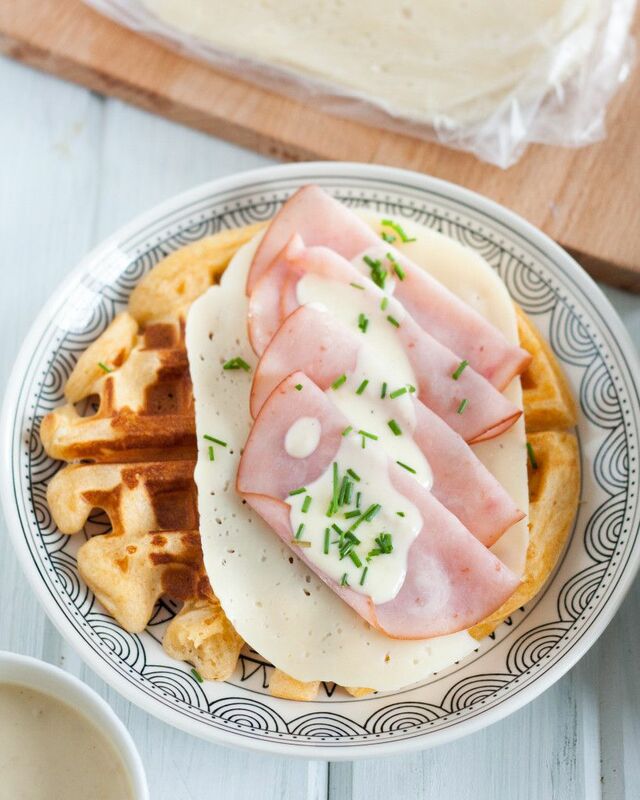 I hope you enjoy my recipe for the croque monsieur waffle sandwich! While we did enjoy these for brunch one day, we’ve also had them (and variations) for lunch and dinner. Waffles make sandwiches a little more fun, don’t they? 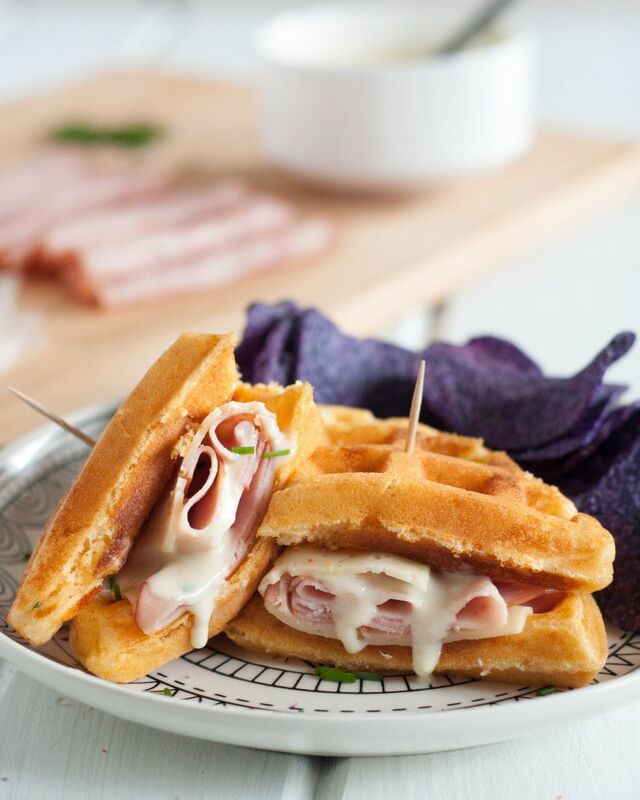 A Croque Monsieur Waffle Sandwich is a great alternative to traditional brunch dishes. 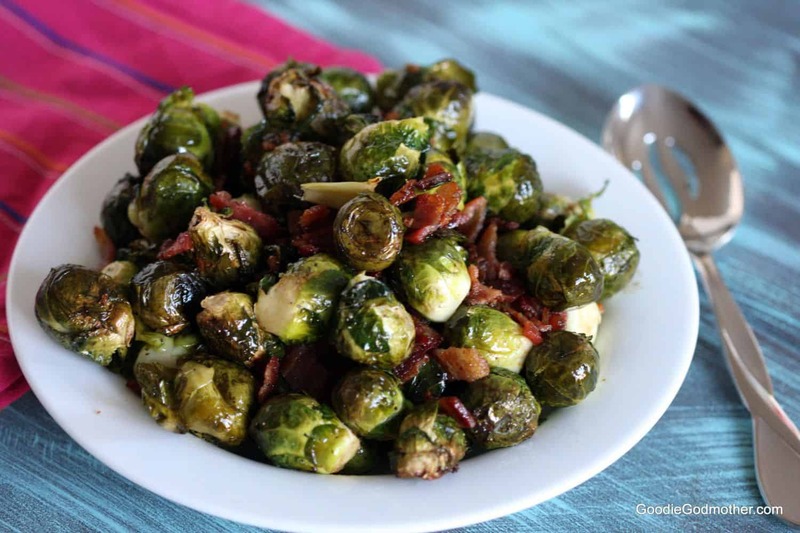 It also makes a great lunch and a unique breakfast-for-dinner dinner idea! Whisk together the dry waffle ingredients in a medium mixing bowl. 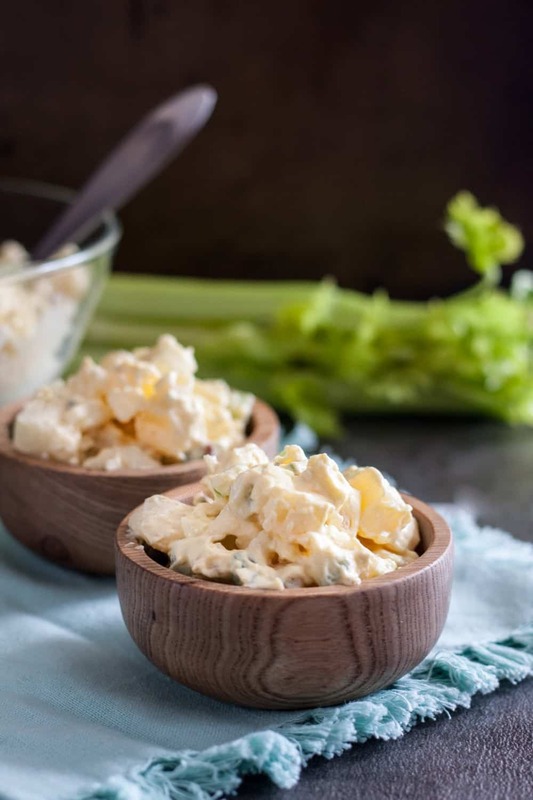 In a large measuring cup or small bowl, whisk together the wet ingredients. Pour the wet ingredients into the dry and mix until a mostly smooth batter forms. Set aside while you preheat your waffle iron. If you have a single waffle iron, preheat your oven to the lowest setting, then turn it off. You will use the oven to keep the waffles warm until you are ready to serve. 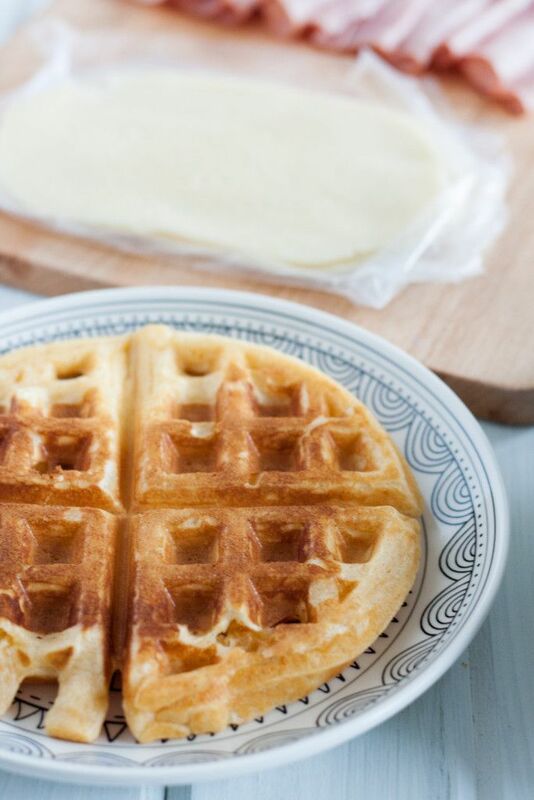 While the waffle iron preheats, melt the butter in a small sauce pan over medium heat. Whisk in the flour, then slowly drizzle in the whole milk. Reduce the heat to medium low, add the spices, and stir for 3-5 minutes until the sauce has thickened. Transfer the sauce to another container, remove the bay leaf, and set aside. Remove your ham and cheese from the refrigerator to bring them closer to room temperature. Cook your waffles to your preferred level of "doneness" following your waffle iron manufacturer's instructions. Grease the waffle iron if needed to prevent sticking. Store cooked waffles in the warm oven until you are ready to serve. Assemble the sandwiches by topping with 2 oz ham, 1 slice Swiss cheese, a bit of the sauce, and fresh chives, if desired. You will have extra waffles if you make only 4 sandwiches, I put those in the freezer to reheat later. Oh, how I looove croques! And so with you on the savory waffle thing. I need to get my act together and get a waffle iron, aready! LOVE! You had me at waffles and cheese! I love those purple potato chips too! This looks so good. I tried experimenting with a Monte Cristo sandwich the other week. Major fail! This looks MUCH better. This is absolutely brilliant! I now realize that I NEED a waffle sandwich in my life! I got both of my waffl irons at yard sales, and they both work beautifully. I’ve never made anything like this with them, but I should! 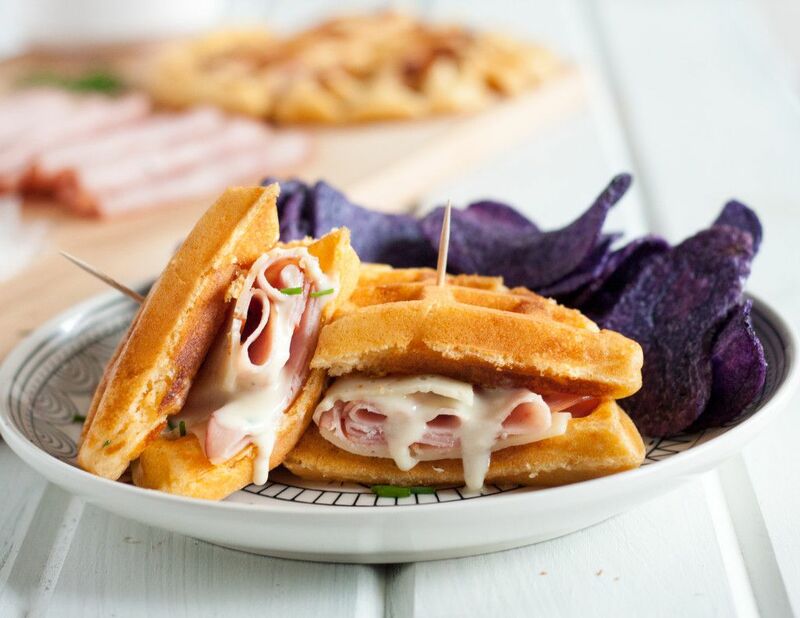 Ham and cheese sandwich…with waffles. Dear lord girl I’m sold! It’s delicious! One of the options for our May brunch.